With the weather as cold as it is right now, I think it can be difficult to get motivated to look good. Without a doubt layers keep you warm but if done poorly, they can leave you looking messy. So I was on the hunt for winter style inspiration, and after sourcing these photos... it's clearly possible to be warm and stylish in the cold winter months. Here is my round up of 7 Ways To Master Winter Style. 2. Wear White, Tan & Brown. 8. Have a Catch -All Handbag. Fabulous, right? I'm inspired to look within my own closet to come up with some better winter looks. What do you think? How do you stay stylish in the dead of winter? Sources: Grazie.it, I am Khatu, Refined Style, Lolobu, BeStylus, Pinterest and SuperStarMagazine. Great tips. I definitely need to add some colour to my winter wardrobe. I have TOO much black! I'm really not all that stylish at the best of times, and in the winter warmth has to come first - especially when I'm out walking the dogs :-) I love my purple plaid winter coat, which I think is pretty stylin' :-) But when I'm out walking the dogs, it's the double-layered down coat with the hood and a headband and Canada 2012 mittens and big clunky boots that are warm and waterproof! Oh you've just reminded me I need a leather jacket! I also agree with wearing faux fur - I'm a huge fan! 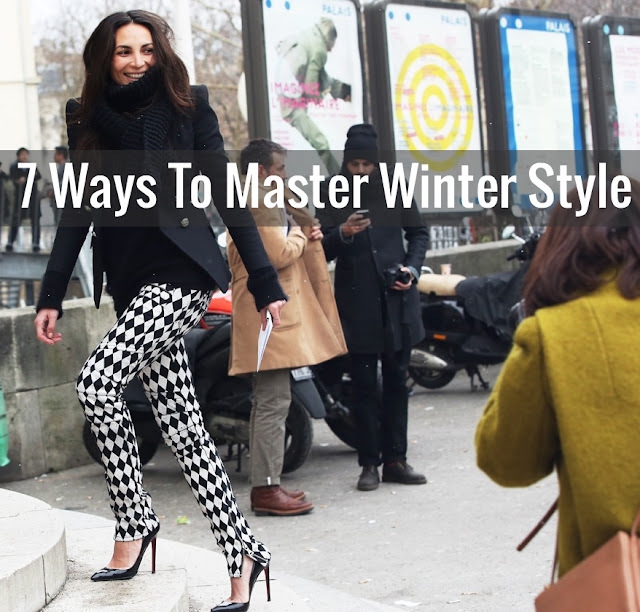 "7 ways to master fall style" would more appropriate for a northern winter. Good luck wearing heels in the slush and snow of a Toronto winter. Not to mention that light-weight leather jackets and wide open sweaters with scarves are not nearly warm enough. These items are lovely but a far cry from winter wear. If You Love It - It Works.